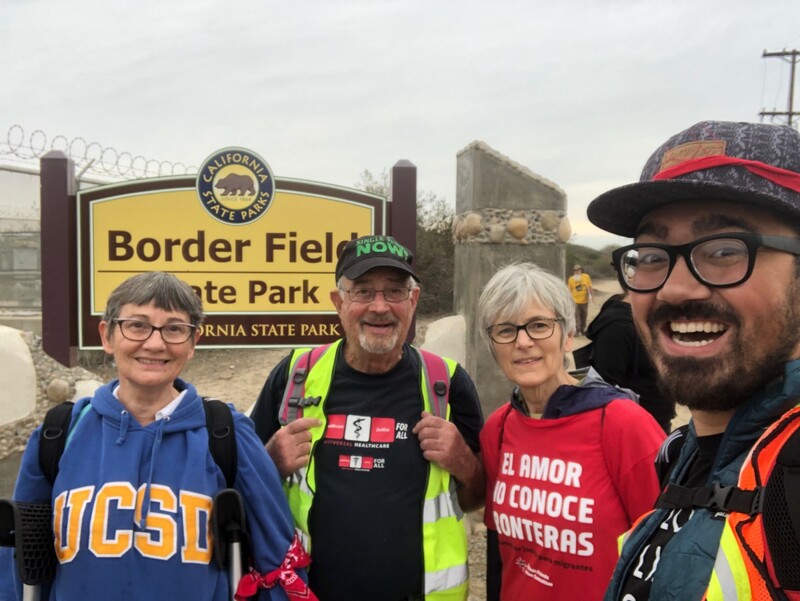 December 10th was International Human Rights Day, and a colleague from FirstPres Hayward and I spent time at the California/Mexico border participating in two distinct acts of support and advocacy for the rights of migrants. I spent the day in Tijuana partnering with Adam McLane, a youth minister and advocate from San Diego who has been delivering relief supplies for migrants residing in recently-established Tijuana shelters. 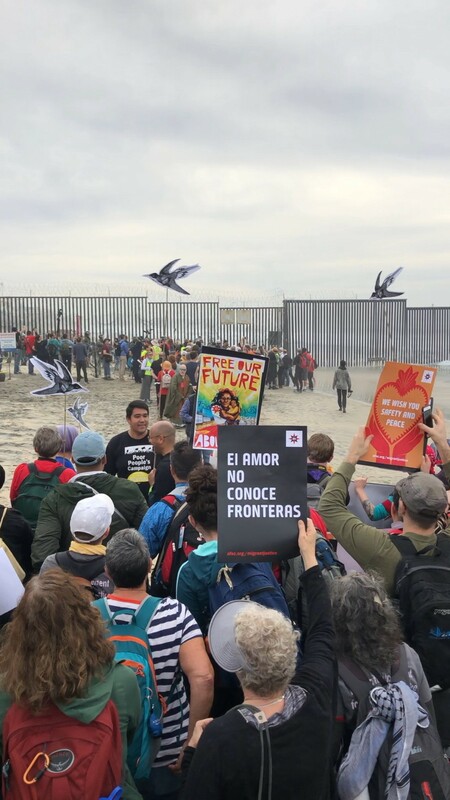 In contrast, Nick spent the day on the U.S. side of the border, joining a group of over 400 clergy and faith leaders who were advocating for migrants and refugees through a protest and direct action at Friendship Park. It was a rich day for us both. For me, it was somewhat surreal to be on the ground in Tijuana. 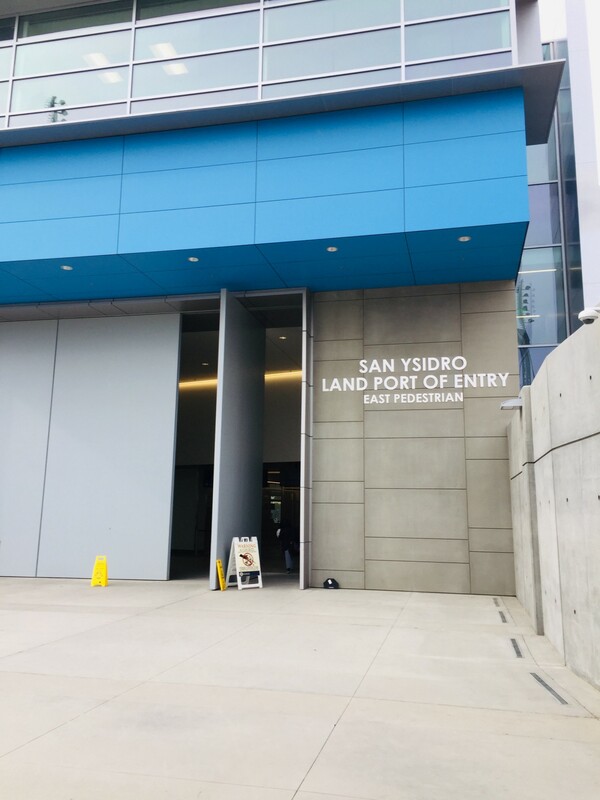 I woke up early in the morning, met Adam close to the border (at a shopping outlet right by the border crossing), and drove into Tijuana to visit a few key sites where migrants are being served, processed, and housed. We visited El Chaparral and the area where “La Lista” is held. This list holds the names of migrants who are trying to seek asylum in the U.S., and it is estimated that of around 5,000 names currently on the list, only about 40 are being called every day (though the number varies from day to day). While there, I talked to one woman (in my broken Spanish), who was with her sister and several small children. They were bundled in winter clothes to endure the 63-degree weather, and I was struck by how calm and matter-of-fact they were about their hope of being called that day. At the new shelter, Adam pointed out the large pink building -an enclosed space- specifically housing over a thousand children. While walking around, I also noticed clearly marked “zonas” — de salud, alimentos, baño, etc.- and signs of a developing community- the emergence of small vendors, people cooking over hot plates, the presence of artists, lines of applicants trying to get work permits, and community areas with music playing and a few people dancing. I also saw people getting vaccinated, tables to talk to psychologists at, and even somebody getting their teeth cleaned in a mobile dental clinic. I was surprised by the clear presence of Mexican officials in both sites, whether through health workers, police officers, or those delivering supplies. I was also surprised that there didn’t seem to be very many American relief workers around, and felt conscious about my “outsider-ness” and our desire to be as discrete and inconspicuous as possible. Because we were unable to deliver the collection of donated medical supplies to the Iglesia del Nazareno en Mexico clinic (as originally planned) we ended up visiting and dropping off supplies to a church Adam has been partnering with- Iglesia Christiana Camino de Salvacion- a church that has been working with the government as an official migrant shelter for over 2 years already. 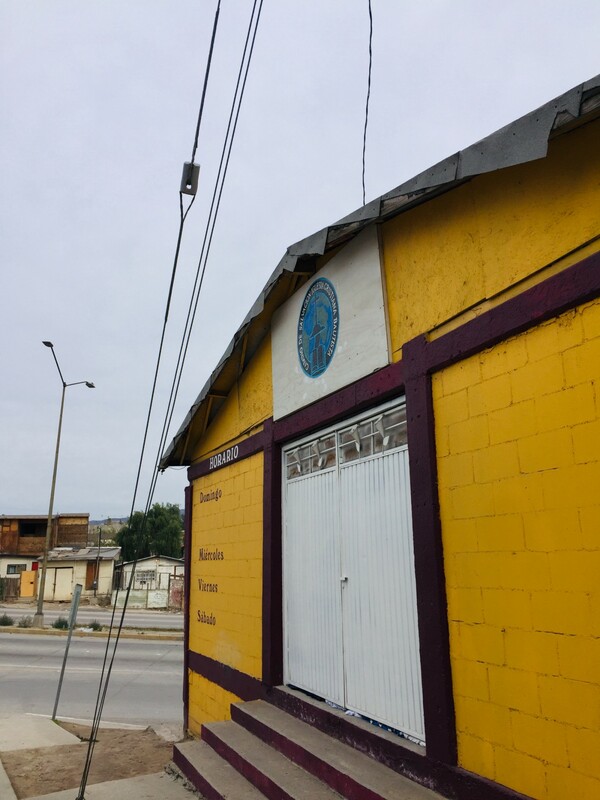 This church, along with other Mexican churches throughout the area, is currently hosting from 30–40 people at a time. They are hoping to retrofit their building and build another floor in order to create more official private quarters and rooms, in dormitory style, to house these migrants. As we concluded our time, I was able to experience crossing the border on foot, since Adam has a Sentri pass and I was unable to stay in the car with him. I was struck by the number of people who regularly walk across the border each day- for work, for school, to shop, etc.- as well as the amazing privilege that comes from me simply having a U.S. passport. 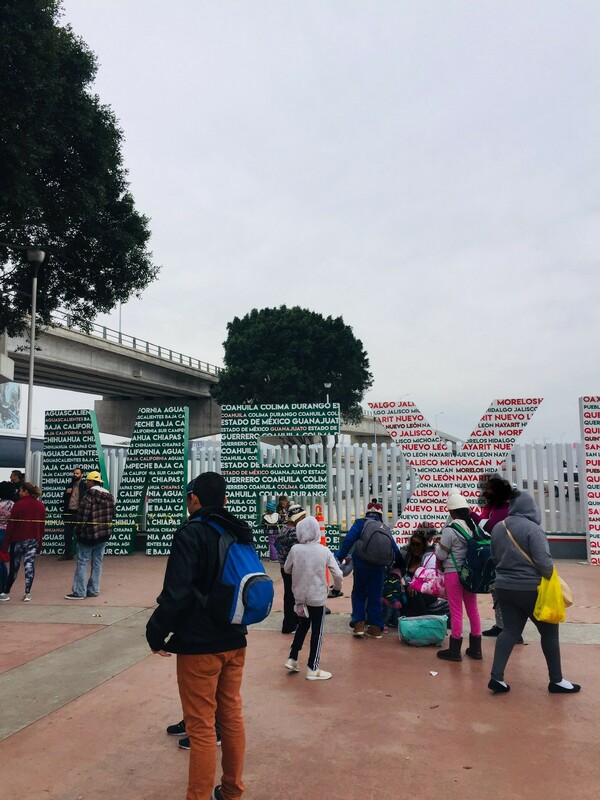 In many ways, the San Diego and Tijuana communities have immense amounts of overlap and interconnectedness, yet the large walls, barbed wire, and armed police are a constant reminder of the political border that divides and separates. These participants marched for several miles on the beach from Border Fields State Park to Friendship Park, where there was a planned event of civil disobedience. 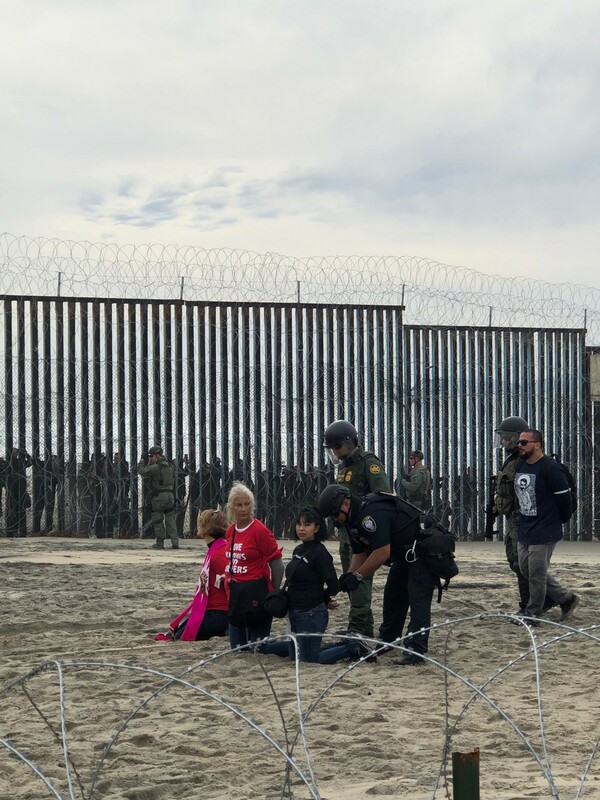 Friendship Park, famously known as place where people on opposite sides of the border were once able to touch and commune with one another, is now a militarized area saturated with barbed wires, sensors, surveillance cameras, and armed border patrol officials. Nick, who served as a medic during the event, was grateful and excited for the chance to participate in a direct action for the first time. He was surprised by how moving and spiritual the day was for him, and blessed by the friendships he made along the way. He also gained a new perspective on civil disobedience and the act of protest, and was impressed by how disciplined, thoughtful, and intentional every aspect of the action was. It was the first time that he was truly able to see how nonviolent civil disobedience confronts the powers and reveals an injustice, rather than being just an angry, unproductive rant to the authorities. The resiliency of the human spirit: Despite all the horrible injustices happening at the border and in our country, I am amazed by the resilience, the determination, and the endurance exhibited by the human spirit. So many of the migrants have suffered unfathomable amounts of physical, emotional, relational, and economic hardship, and yet continue to exhibit levels of patience and endurance that put American entitlement to shame. I also wonder how the songs, art, innovation, and gifts of migrants from these caravans will shape Mexican (and American) society for future generations. I wonder how their faith will shape the Church as well. 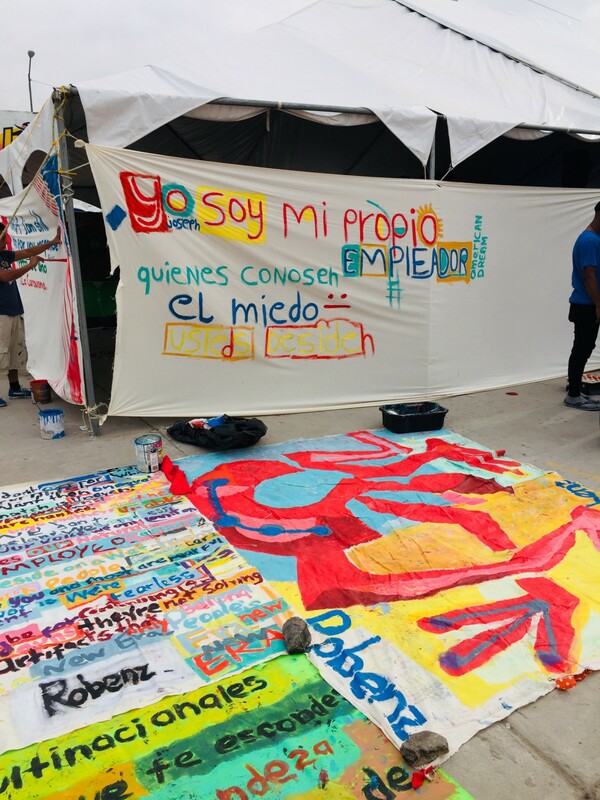 The power of collective action: Whether in a group of thousands of migrants who traveled together for thousands of miles, or in a group of hundreds of clergy who marched together for a few miles, I am struck by the notion of a spiritual “caravan” and the power that comes from moving and working together. Every part in a community matters. Every gift, every voice, every body is needed. From medic to peacekeeper to photographer to arrestee, each member contributes their part to achieve a great her whole. And I am reminded by both of these groups of how much farther we can go when we journey together. The subjectivity of our borders and immigration law: While many continuously argue for people to come into the U.S. the “legal way,” the reality is that these laws and their interpretations are continuously changing. Definitions of asylum are, even now, being shifted and changed. The lines drawn to separate our country from Mexico have historically been contested, redrawn, and moved. 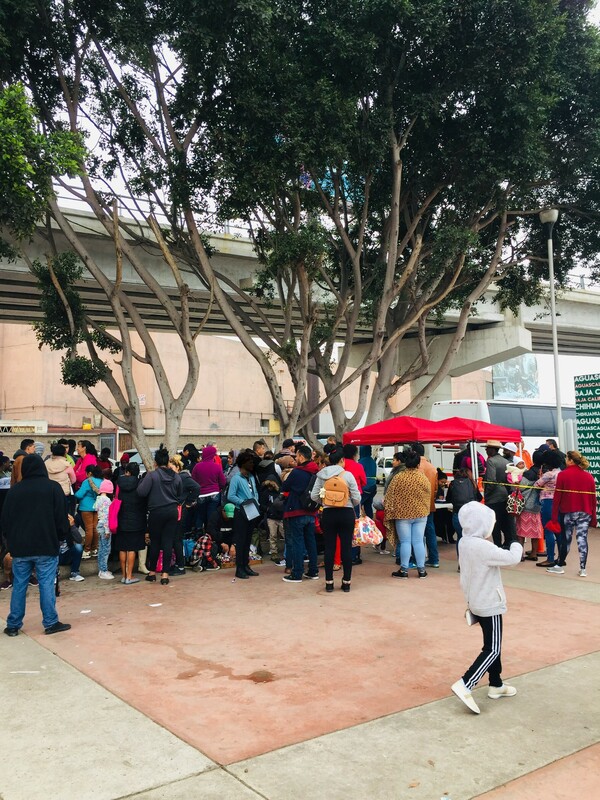 Seeing how intertwined the Tijuana and San Diego communities are reminded me that borders truly are a human construction and have always been a tool for the political, economic, and social gains of those in power, regardless of their impact on the poor and vulnerable. The need for both policy change AND direct relief: I am grateful that FirstPres got to participate in meeting the holistic needs of migrants. 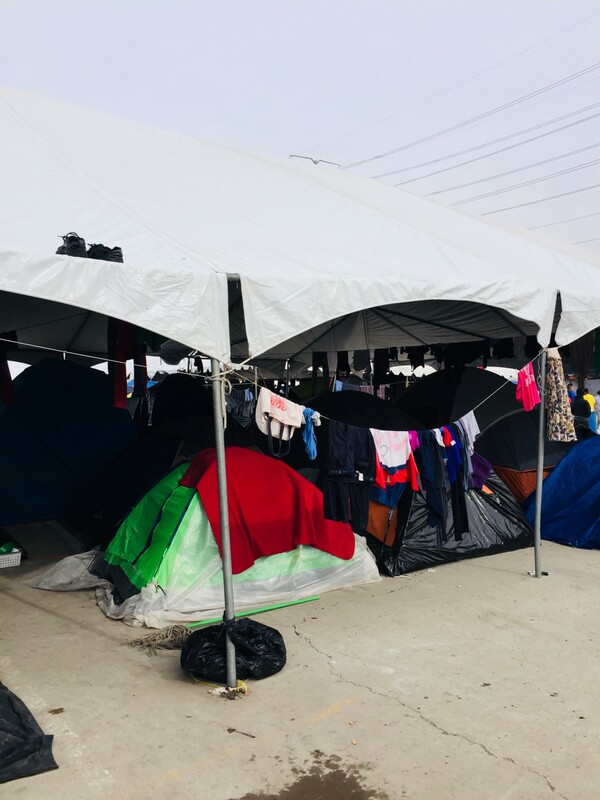 The reality is, migrants in the Tijuana shelters need direct supplies such as lice medicine, probiotics, and toilet paper. These relief supplies help meet concrete needs on the ground and make life a bit more live-able. But these migrants ALSO need a change in policies and legal procedures that will allow them to present their cases and not just be stuck living in a tent for the next year. They don’t just need relief for the present, but they need pathways to build a future. Both are important and we cannot forget that. The importance of indigenous leadership: While I was grateful for the chance to visit Tijuana, I realized how useless and unhelpful I was in many ways. 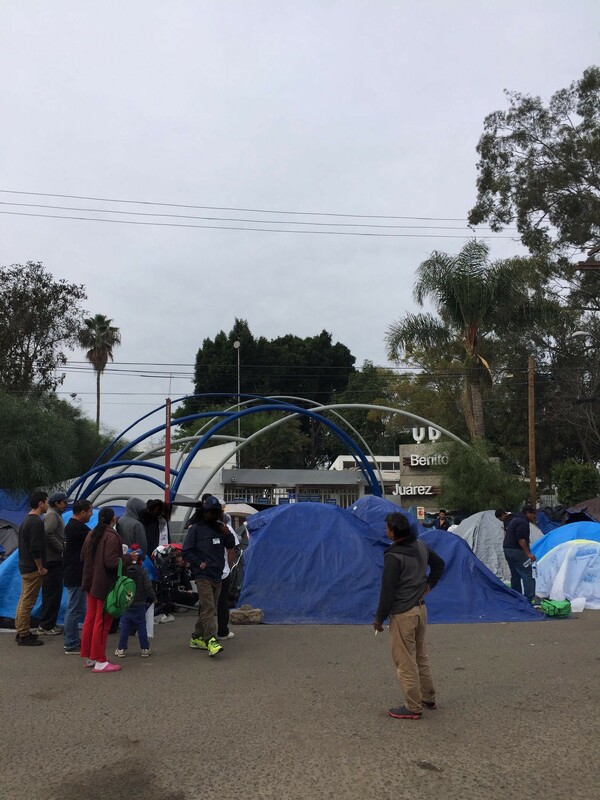 With very basic Spanish skills, a lack of knowledge of the culture and experiences of Central Americans, very little understanding of immigration policy, and no tools for navigating Tijuana, I was thankful for Adam’s faithfulness to respond but also cognizant of the ways our ability to “help” was incredibly limited. Adam has been glad to defer to the leadership of Mexican churches and I was reminded (again) of the importance of supporting indigenous leaders to meet holistic needs. In closing, here are the words that were from my Advent reading yesterday morning, before I left for Tijuana. your afflicted ones with justice…. As we continue in this Advent season, I am praying and waiting for the incoming reign of King Jesus- the true King who can judge with righteousness, bring an end to oppression and violence, and make all things new.